Marla Restaurant and Denizli Tennis Club, serves lunch and dinner, as well as organizations for parties like weddings or other events. Saki is a popular restaurant and pub in the Turkish city of Denizli. They serve a variety of grilled meats, fishes, and also serve alcohol and have live music. 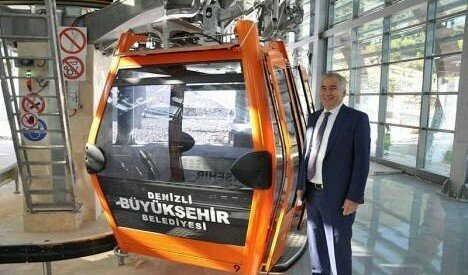 Denizli has opened it’s new cable car from the neighborhood of Bağbaşı to the top of the mountain. This cable car takes visitors to the top of the mountain to have the view of Denizli, and also to visit the picnic area, as well as camping and a tea garden. To get to the Denizli cable car, you can take a taxi or minibus from in front of the Denizli bus station. The minibus is called “Yeniyol” and you can ask the driver for the Teleferik stop. You will then walk up the hill following the signs posted there. *Disclaimer: Yildirim Hotel and Yilman Turizm are not affiliated in any way with Tours4Turkey, we do not accept commission or remuneration, and take no responsibility for tours or any other bookings made through Tours4Turkey.com. Tavuklu Sultan Kebap is a Chicken stew served inside a pocket, and baked in the oven. Pideli Köfte if a Turkish beef dish composed of grilled or fried meatballs on top of toasted flat bread with tomato sauce. Tavuklu Patlican Oturtma Is the Turkish name for a dish made with chicken, eggplants, and tomato for flavor.